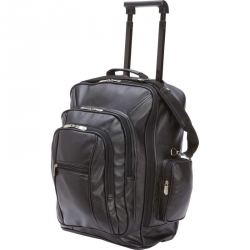 Features multiple pockets; locking telescoping trolley handle; padded shoulder strap with swivel clips; padded hand strap; reinforced sewing on the leather where all handles and straps adhere to the leather bag; and reinforced double layer bag bottom. Measures 11-3/8' x 21' x 13'. 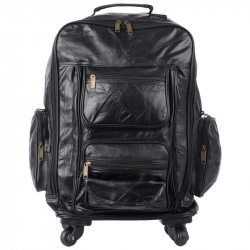 The Embassy(TM) Genuine Patch Leather Trolley Bag-Backpack is a superb piece of luggage that covers a lot of ground. 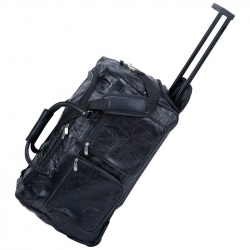 A retractable handle and 4 spinner wheels allow you to use the bag as a pull-along case, or retract the handle and use the trolley bag as a backpack for school, work, or travel. 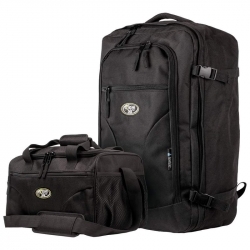 Plenty of storage space in the main compartment, and also offers 4 zippered outside compartments, a comfortable carrying strap and handle, and stylish black zippers with antique-color zipper pulls. 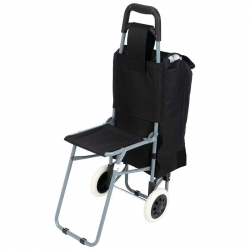 Features multiple exterior pockets, silver-tone hardware, push button release, telescopic trolley handle, and adjustable shoulder straps. Measures 16-1/2" x 19" x 7-1/2". Travel days or shopping trips don't have to be daunting with the comfort and convenience of Maxam(R) Trolley Bag with Folding Chair. Rest your feet, relax, and easily carry your items while on the go. Features drawstring bag with zippered inside pocket and folding chair. Chair holds up to 220lbs. Measures 14-1/4' x 36-1/4' x 21-3/4'. Get ready to travel with the two pieces you want and need for most trips. The upright case will hold your garments neatly with elastic tie-straps so they don't shift around. It features separate pockets to keep your shoes and essentials separate and organized. It fits in the overhead bin on the plane while your zippered travel tote stores neatly under the seat. Each piece has a sturdy handle and the tote has a shoulder strap as well. 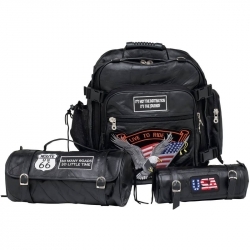 The Diamond Plate(TM) 3pc Rock Design Genuine Buffalo Leather Motorcycle Bag Set includes an 11" x 4-1/2" x 3-7/8" tool bag, 14" x 5-7/8" x 5-7/8" barrel bag and 14" x 18" x 7-1/4" sissy bar bag. Live To Ride(R) brand embroidered cloth patches are included and already sewn in place. 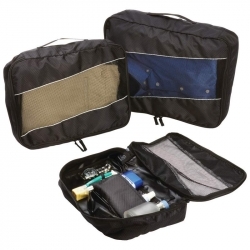 Features 210d hexagon check polyester with handle, zippered see-through mesh compartment, and interior pouch. Large bag measures 17' x 12' x 4-1/4', medium bag measures 15' x 10' x 3-3/4', and small bag measures 13' x 9' x 2-3/4'.